Earlier this week, Human Rights Watch awarded its prestigious Alison Des Forges Award for Extraordinary Activism to two human rights defenders from the Democratic Republic of Congo and Libya. Father Benoît Kinalegu, the Congolese recipient, is a priest and longtime activist working to document and end the atrocities committed by the Lord’s Resistance Army, or LRA, and rehabilitate survivors of LRA violence. Based in the town of Dungu in the Haut-Uélé district of Congo, which for years has been plagued by LRA violence, Father Kinalegu and the Catholic Diocese’s Commission for Justice and Peace helped establish an Early Warning Radio Network that allows communities to report LRA attacks and movements as they take place, which then provides an advance warning to communities, the U.N., and humanitarian organizations. 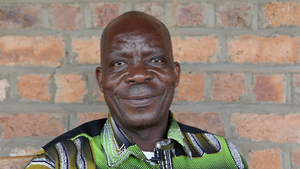 Father Kinalegu is now establishing a rehabilitation center in Dungu for children who were abducted by the LRA, and he has been a vocal advocate for stronger, better coordinated responses by the Congolese government and the international community to the crisis. Speaking with Radio Okapi this week, he urged authorities to apprehend LRA leader Joseph Kony. This annual Human Rights Watch prize honors the legacy of esteemed researcher and writer Alison Des Forges, who was a leading authority on Rwanda and worked nearly two decades for Human Rights Watch as a senior advisor to their Africa program. Des Forges died in a plane crash near her hometown of Buffalo, New York in 2009. The award recognizes exceptional dedication to defending human rights, often at great personal risk to advocate on behalf of those who are abused, discriminated against, and oppressed. I had the pleasure of meeting Father Kinalegu this June while he and Sister Angélique Namaika, who runs the Dungu-based organization Mama Bongisa, were in Washington, D.C. to talk with the Obama administration and Congressional offices about the LRA. Father Kinalegu struck me as an extraordinarily warm and kind person. One of the things he spoke about was the fact that the Congolese government does not recognize the LRA as a threat to civilians and stability, and he urged the U.S. government to push Congo to both acknowledge the notorious rebel group as a significant problem, as well as work with other governments in the region to bring an end to the LRA. This is particularly critical now. Congo is increasingly becoming a safe haven for the LRA. The Congolese government has prohibited the only army conducting offensive operations against the group—the Ugandan army—from pursuing the LRA in Congo for almost a year, and the U.S.-trained battalion of the Congolese army was moved in July from LRA-affected areas in Congo to Goma to fight the M23 rebellion. Father Kinalegu is so deserving of the Human Rights Watch award. Congratulations to him and to this year’s other recipient, Salah Marghani, a Libyan human rights activist and lawyer. May their work be an inspiration to others dedicated to defending human rights.